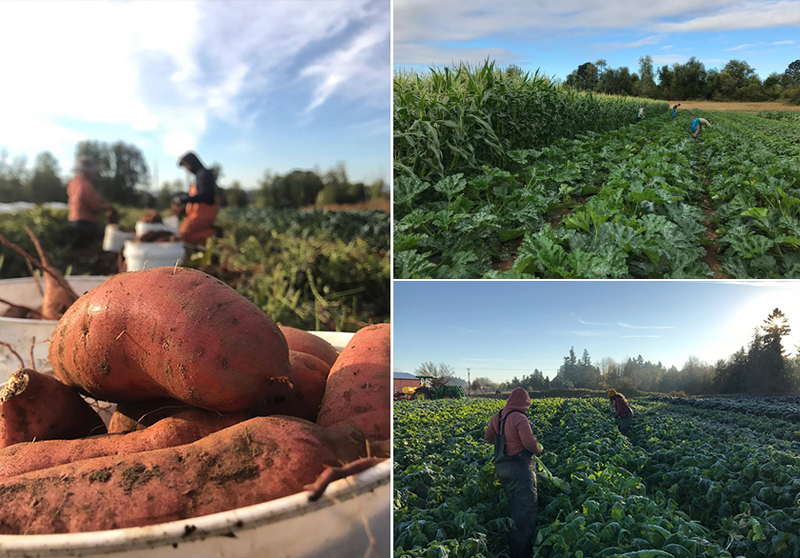 Working Hands Farm is a small organic diversified vegetable CSA farm (200 shares) located on 40 acres in the Willamette Valley, just outside of the city of Hillsboro (15.2 miles from downtown Portland, Oregon). We have been in operation since 2010 and grow year round through our Spring, Summer & Fall CSA & Winter CSA. *Important note… Working Hands Farm does not provide housing or meals for farm crew members. All farm crew members must live within a reasonable distance of the farm and be able to provide their own reliable transportation for themselves to and from the farm. Working Hands Farm is looking for 3 part time employees to join our harvest crew for the 2019 season. The Harvest Crew position will focus on all aspects of harvest and post-harvest handling of the over 50 vegetable crops we grow for our CSA. This position is part-time 2 days/per week for a total of 14 hours/per week. We have positions opening starting in both April and May and that continue until the 3rd week in November. Must be physically capable to perform all farm tasks in all weather (hot, cold, rain, etc). Farm work requires kneeling, squatting, repetitive grasping, standing and bending for long periods of time. Those with weak backs or past injuries should strongly consider this before applying. Must be able to work well with others as well as to work well independently. Must be able to interact with CSA members is a polite and respectful manor. Employees are responsible for arriving to work 5-10 minutes before the start of the day and ready to work on the hour. Bulk harvest of crops: garlic, onions, winter squash, potatoes, sweet potatoes, cabbage, carrots, beets, root crops etc. After harvest is completed harvest crew members may be asked to participate in a number of other activities such as weeding, irrigation, seeding, transplanting etc..
All candidates must commit for a full season on the farm, from mid-April or May through the 3rd week in November. Up to 14 hours per week. *There is potential for a third day a week depending on work, availability etc. Work days are Monday & Tuesday 7:00am-3:00pm depending on daylight hours and workload (start time can very up to 2 hours). There is an unpaid one hour lunch break each day. At times we may require crew members to work shorter or longer hours depending on weather and/or work load. IMPORTANT: Please do not apply if you cannot complete the full season, though there is some flexibility in the start date. Being outside in the fresh air and sunshine, working with a bunch of great people and having access to fresh, organic produce! Evaluation Period All candidates will have a 6 week review to evaluate if they are a good fit for the farm or not.